Yep. It was time. Saturday the decorations came down. And I listened to Christmas music the entire time. Gotta squeeze every ounce out of Christmas that I can, right? OK, I’m kidding. There’s more to it than that. The first thing I wanted to focus on was getting the tree down. The rest of the decor could wait until the tree was out of the way because it’s the thing making the pine needle mess and was a huge fire hazard as well. What?! Why the camera and tripod? You’ll find out. Patience, my friends. 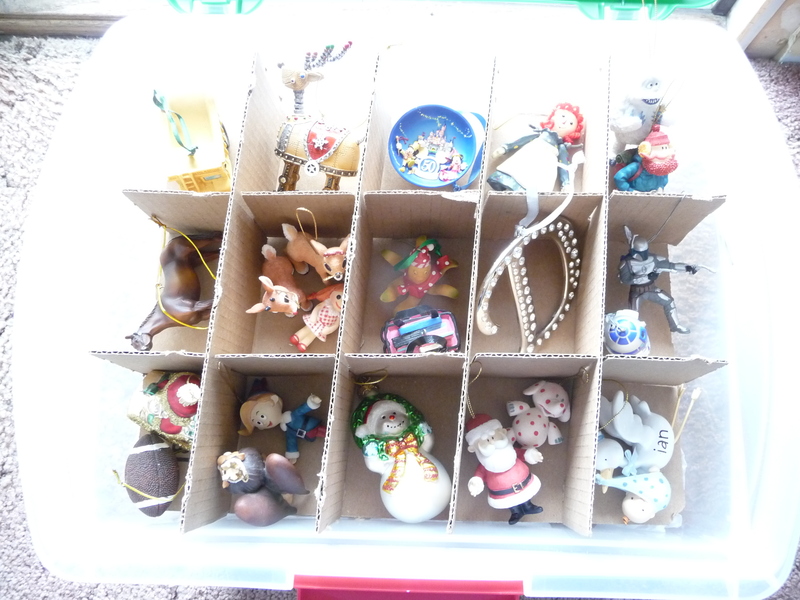 These are the boxes I use for my ornaments. I bought them at Target years ago. They probably still sell them since it’s a pretty common way to store ornaments, although there are lots of different types of ornament boxes; just pick what you like best. All our ornaments go in them with the exception of these huge babies. They were a gift from my grandma back when I only had 3 children. Back to the huge ornaments: Not only are they super big, but they’re quite fragile. They don’t fit in the ornament boxes anyway, so I keep them in their own box, wrapped in bubble wrap. 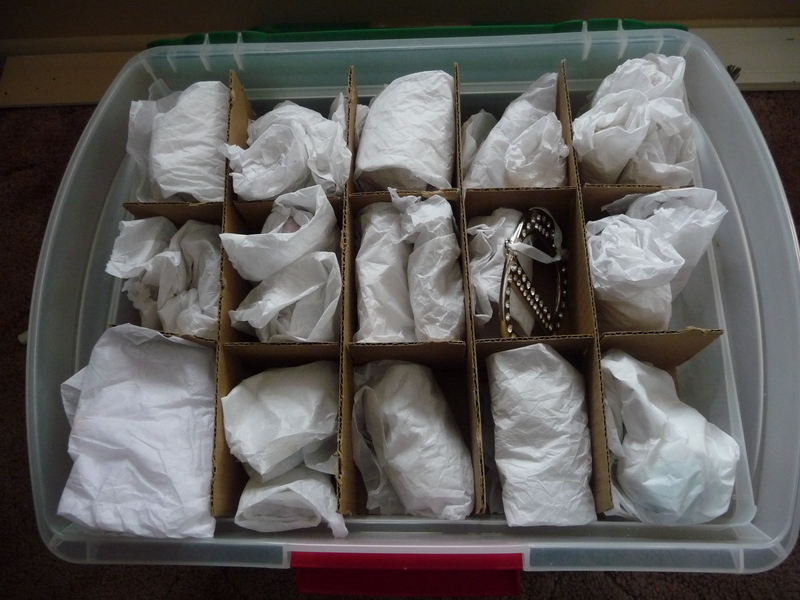 Now I used to think that since my ornaments were in these neat little cardboard compartments that I didn’t need any other type of protection around them. That all changed the day my boxes fell off the top of the other boxes they were stacked on. Many of our ornaments shattered and couldn’t be fixed. It was a sad, sad day. Now I wrap the more fragile ornaments in tissue paper before they go in the box. It’s an added layer of protection and it works well. I know because the boxes were dropped another time and not a single ornament broke. Yes, we need to stop dropping our ornament boxes. It’s a bad habit. So get your tissue paper out. It takes a little extra time but is so worth it. Don’t they look all snug and cozy? These ones look bare and lonely. 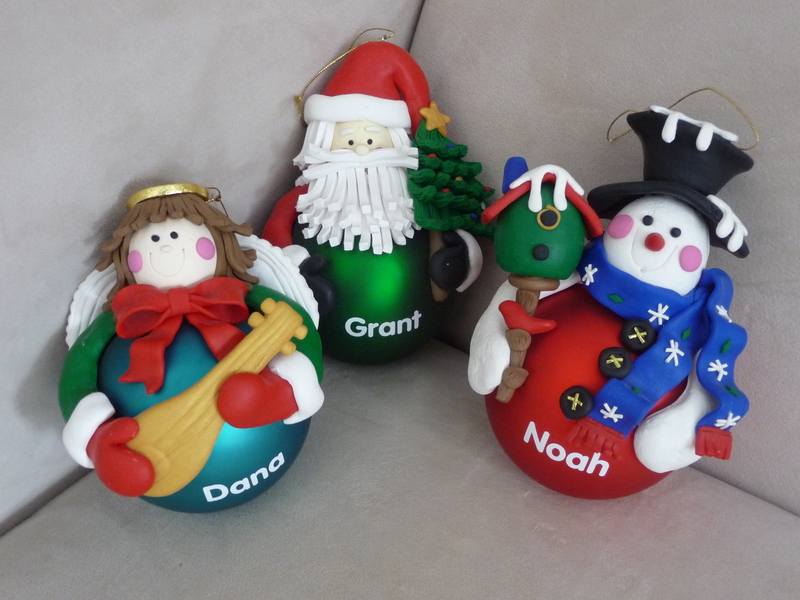 Plus, the breakable ones are more likely to get chipped or damaged by banging into the ornament next to them. Take your pick: do you want your ornaments to be snug and cozy or bare and lonely? Choose carefully because this will define your character. If you choose snug and cozy, then read on. If not, don’t take another step towards your ornaments. You will only hurt them. Back away from the ornaments. As you take your ornaments off the tree, give ’em a quick wrap up in tissue paper and nestle them in their spot. Super simple. Super easy. Oh, you want to know about the camera and tripod? Sorry, but I’ve got to go. 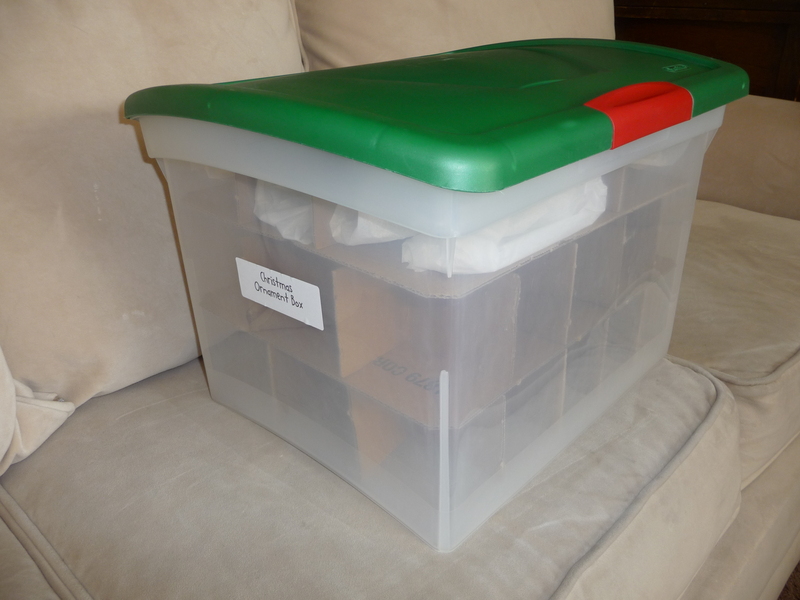 This entry was posted in Holidays, Organizing and tagged Christmas ornaments, ornament boxes, tissue paper. Bookmark the permalink.